St Kilda may have lost the finals this year, but all is not lost for the...general... area around St Kilda. 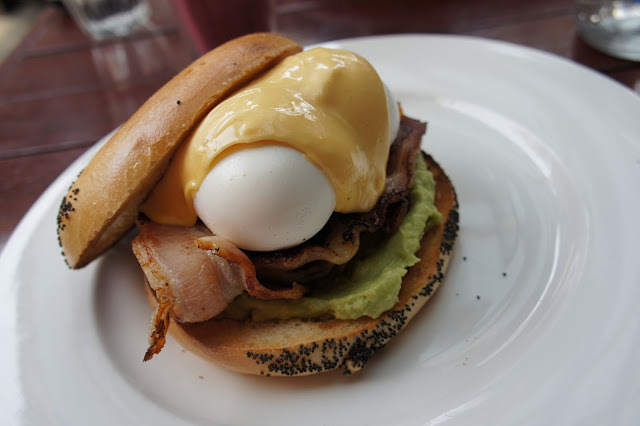 Situated in Balaclava (a suburb right next to St Kilda) is trendy Las Chicas. Generous offerings of cafe staples, fantastic coffee, and a cool, laid back atmosphere make this place stand out more than most. Many have tried to conquer the monstrous breakfast burrito, and Bun was up for the challenge. The soft tortilla could barely contain the filling - made with four eggs, four rashes of bacon, aioli, crisp rocket, topped with tomato salsa, and a heap of avocado. The fluffy scrambled eggs and the fresh juicy tomato salsa were highlights of this very tasty meal. The bikini blowout benedict - avocado, bacon and two poached eggs on bagel toast topped with a giant dollop of hollandaise sauce. Bun's first thought - 'the poached eggs look like balls'. After piercing the sacs and letting the runny yolk cover the rest of the dish, this quickly became a messy wonderpalace. Although it didn't retain its prettiness after my initial hackings, the taste was undeniably delish (albeit a little heavy at parts due to the hollandaise sauce). I had to break up my meal by taking bites out of Bun's. HA! Make sure you get here early because this place packs out, especially on the weekends. And if the weather permits, ask for a spot in the sun-speckled courtyard out back. We shall return. Stumbled upon your blog to find evidence to show my sisters that we HAVE to go to Las Chicas this weekend. Love your blog! Would love to know your opinion of Yellow Bird in Prahran, as it's probably my favourite cafes besides Vegie Bar in Fitzroy. Anyhow, keep up the good work!